After 70 years as a loyal and faithful servant, went to rest in the arms of his Lord and Savior on January 16, 2019. He was born to Della Virginia Kuehl (nee Preisch) and Rev. Henry A. Kuehl, on March 25, 1923 in Dennison, Ohio. The Kuehls moved to Bethlehem PA where Rev. Kuehl attended Moravian Preparatory School and graduated from Emmaus High School in 1940. He graduated from Moravian College in Bethlehem and immediately enlisted in the US Navy as a member of the Chaplain Corps electing to attend Princeton Theological Seminary. On December 21, 1944 he married Gloria Markwood Harp. Upon his graduation from Princeton Seminary with a Master’s Degree in Theology and discharge from the Navy as a LTJG in 1946, he became Chaplain and taught Religion and Philosophy at Moravian College. His first position as a parish priest was a Curate at St. Luke’s Episcopal Church , Scranton, PA. He became Rector of St. Mary’s Church in Reading, PA, followed by The Church OF Our Merciful Savior, Penns Grove NJ, The Church of St. Barnabas, Irvington-on-Hudson NY, and St Paul’s Church, Rochester, NY. While at St. Paul’s he took a six month sabbatical leave for the graduate study of History and Theology at Cambridge University in England. In 1969, Father Kuehl made the decision to leave the parish ministry. He became the director of Community Affairs with Darcy Communications. In 1971, he married Sally Street Hickok. 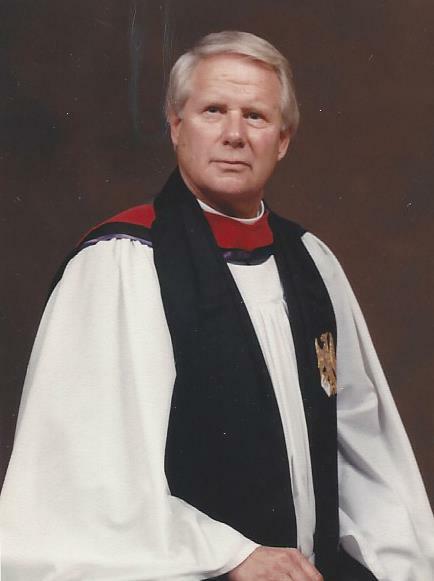 In 1973, he returned to the ministry and became the interim Rector of St Luke’s, Rochester. Then he was called to St. John’s Church, Barrington, RI. He retired from St. John’s as Rector Emeritus in 1989. Rev. Kuehl was predeceased by his first wife, Gloria, his second wife, Sally, his sister, Mary Catherine Concevitch, and his youngest son, Andrew. He is survived by three children, Karen Lester of Deer Isle, ME, Deborah Kuehl of Livonia, NY and David Kuehl of Veracruz, Mexico, his six grandchildren, five great grandchildren, one great great grandchild, one niece, two nephews and three stepchildren. Memorial contributes may be sent to, Memorial Garden Fund, St. John’s Episcopal Church, 1 County Road, Barrington, RI 02806.